Are you willing to risk it all for the purposes God is summoning you to? Will you allow his perfect love to so fill you that there simply is not an inch for fear to creep in, poisoning your confidence in who he is and what he has said he will do? Would you gather up courage to move forward in faith even though there are no guarantees? The life and teachings of Jesus never herald a cautious way of living. He does not purpose us to live in safe restriction, rather he longs that we walk in abundant liberation. He wants us to live and love with flamboyance pouring ourselves out, not clutching our thin souls in self-protection. This is one of the things I love most dearly about him; he beckons us to run to him with utter abandonment. What we find in the immersion is that the water is fine, utterly freeing. There is a woman I know, I mother I wrote about in my book who lives like this. I know she goes through the questions and frailty as much as any of us, but those do not have the longest victory in her life; truth reigns. I’m moved again by her latest long obedience. Cheering for her and her precious family, I see again more of who God is. He loves me like he loves this precious new baby of theirs. Her family is screaming all of our stories yet again. We are all abandoned orphans but our father came back for us. Let him reclaim and release you, as you read her family’s story. You belong, you are wanted, you have a home. “When we left the US mid-March our hearts were full of sadness and confusion over the failed Frozen Embryo Transfer. For the past few months we have been praying that God would clearly show us what he wanted next for our family. 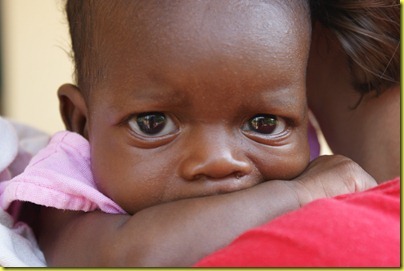 When we returned to Uganda our hearts were again touched by the amount of orphans and the suffering that they endure. 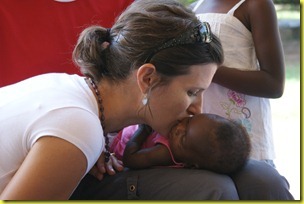 Our hearts grieved and we knew that God was giving us the desire and courage to adopt from Uganda again. We spoke to the director of the local children’ shelter where we got our little son from and told her that we were interested in adopting another child. After that conversation we began praying that God would clearly direct her to the child He wanted for us. We asked that He would give her wisdom and guide her to the child that was to be ours. We waited. We watched many children come in and out of this place and wondered if any of them would be ours. Almost 4 weeks ago, out of the blue, the director called and said that she they just received a 3 month old baby girl and she wanted to talk to us. Tim was in Kampala, so I quickly called him and then went to the children’s shelter. She told me the sad story of 2 attempted abortions, an attempted murder, a Muslim family, a missing mother, and an abandoned baby. She told me that at first they weren’t going to take Zulea into Amecet but as she held her, Zulea looked up at her and smiled and she immediately thought of us. Zulea has survived much in her precious little life and we all agree that God must have a very special plan for this little girl. I was then brought me to meet Zulea. Tears quietly fell and I longed for my husband to be there with me. Tim came back from Kampala the next day and we immediately went to see Zulea. She was perfect and truly everything that our hearts have been silently praying for. It was all perfect, except that the birthmother was missing and therefore could not sign over her rights to us. We need to foster Zulea for 3 years before we can adopt her (as we are doing with Moses) and there is a chance that IF the birthmother comes back and wants Zulea she can take her from us. God was asking us to risk again. We then took 2 weeks to “investigate” the situation. The grandfather, aunts, sisters, and local councilmen all told the same story and reassured us that the mother was not able to care for Zulea. Zulea is her mother’s 6th child and the mother is not caring for any of them. The grandfather simply cannot take care of another child and asked that someone adopt her. During those 2 weeks God spoke to Tim and I separately that Zulea was ours and that God would take care of the rest. He was giving us our hearts desire and would walk with us through whatever is to come. We spoke with with the director on Monday, June 14 and told her that we wanted Zulea. We then quickly filled out the foster care application and on June 15 at 4:30pm we took home our daughter, Zulea Marie Sliedrecht. Zulea was born on March 7, 2010 and currently weighs 8.6 lbs. Avalien and Moses love Zulea and are so good to her. Zulea smiles whenever she sees them. She is full of smiles, giggles and coos. So, now our house is filled with bottles, spit-up and sleepless nights and we are loving every minute of it! Previous Post Enough to Write About. Next Post Is Unity Essential?